Bosse‐Shea—Sarah Bosse and Jeremy John Shea exchanged marriage vows on June 22, 2013, in a meeting for worship held at the home of Jeremy’s parents, Sallyann Garner and John Shea, in Wilmette, Ill. Jeremy, a member of Lake Forest (Ill.) Meeting, graduated from Earlham College in 2003 and is an elementary school teacher in Northbrook, Ill. Sarah, whose parents are Kay Bosse and Tim Bosse, graduated from Ohio State University and works as a visual manager for a retail company. Sarah and Jeremy live in Chicago. Roy‐Ehri—Leah and Colin Roy‐Ehri, of Bloomington (Ind.) Meeting, and their daughter, Riva, welcomed a baby boy, Orion William Roy‐Ehri, on July 14, 2013, at 10:30 p.m., in Bloomington. Orion weighed 7 lbs. 8 oz. and was 20.5 inches long. His grandparents are Ruthe and Bill Schoder‐Ehri, of Friends Southwest Center, Elfrida, Ariz., and Barbara Roy and Michael Roy, both of Indianapolis. Colin is a software developer at Cook Medical and Leah is a lactation consultant at Bloomington Hospital. Corbit—Dorothy Ann Dickenson Corbit, on June 28, 2013, peacefully, at the Quadrangle in Haverford, Pa. Dorothy was raised in Decatur, Ill., and studied fine arts at University of Illinois, University of Iowa, Taller de Grafica Popular in Mexico City, and the studio of Alfredo Zalce in Morelia, Mexico. A member of Haverford Meeting, she married Frank R. Robinson, an artist, in 1941, and later John D. Corbit, M.D. She worked as a medical illustrator from 1949 to 1970 at Tulane Medical School Department of Medicine and Lankenau Hospital Division of Research. Her art was exhibited in local libraries, restaurants, Haverford Meeting, Chilton Company Publications headquarters, the Plastics Club, Tyme Gallery, Allen’s Lane Art Center, and the Quadrangle 2 Gallery. She enjoyed gardening and took classes at the Barnes Arboretum and joined the Horticultural Society. She had two children, three stepchildren, and many grandchildren and great‐grandchildren. Habl—Weaver Rose Habl, 57, on May 8, 2013, in Lansing, Mich., unexpectedly, during recovery from a stroke. Weaver was living in Haslett, Mich., when she died. She was born Mary Kay Fink on June 28, 1955, and her parents were Jody Jones and Raymond Fink. On November 3, 1979, she made a husband of James Bloomfield, her best friend and co‐adventurer in life. They provided an example of enduring fidelity, acceptance, and love to all who knew them. After her marriage, she changed her name to Weaver Rose Habl, reflecting her passions for weaving, her love of hot air balloons, and her belief that your life is what you choose to make it. Her training was in accounting, but her heart was in humanity. Weaver was a long‐time member of Red Cedar Meeting in Lansing, Mich., and practiced Wicca. Shortly before her death, she laid down the responsibility of editing the meeting newsletter to become recording clerk, although she was never able to fully assume that role. Weaver taught religious education to the four‐ to seven‐year‐olds, who loved her dearly. She was clerk of the Nominating Committee, represented Red Cedar on the board of Friends Lake, was a member of a School of the Spirit support group, and had regular lunches with three other Red Cedar Friends. She was fond of the saying: “All creatures, everywhere, are doing the best they can.” Her talents were many, and her mind and fingers were clever. She built a dulcimer and learned to play, sang beautifully, wrote children’s stories, and took the NaNoWriMo challenge to write a novella each November. A voracious reader, she especially appreciated the author Ursula K. Le Guin. Upon learning that her aunt had formed a cooking club in her youth, Weaver created her own cooking club for herself and her sisters, sister‐in‐law, and nieces. She formed a Movie Night each Friday night to hang out with her mom. She loved and treasured her cats, Pete and Sophie, and her children were her nieces and nephews and all children in her sphere of influence. She was preceded in death by her niece, Nikki Fink, and brother‐in‐law, David Bartram. She leaves behind her husband, Jim Bloomfield; her mother, Jody Jones; her father, Raymond Fink (Lillian); two sisters; a brother; three sisters‐in‐law; two brothers‐in‐law, and many nieces, nephews, grandnieces, and grandnephews. The family requests that in lieu of flowers you contribute to the Cystic Fibrosis Foundation, 6931 Arlington Road, Suite 200, Bethesda, MD 20814, or the Red Cedar Friends Meeting, 1400 Turner Street, Lansing, MI 48906. Moger—Elizabeth H. Moger, 91, on June 3, 2013, at Kendal at Hanover, Hanover, N.H. Elizabeth was born on August 14, 1921, in Minneapolis, Minn., to Helen Dennis and Edmund J. Haas, and spent childhood summers at her beloved Vine Hill near Lake Minnetonka, Minn. She graduated from Washburn High School in Minneapolis and attended Carleton College, elected to Phi Beta Kappa and earning a degree in classical languages in 1943. She joined the U.S. Women’s Army Corps (WAC) and served in the Philippines and New Guinea during World War II. These wartime experiences led her to Friends and to a lifelong commitment to Friends concerns. First a member of Homewood Meeting in Baltimore, Md., she later joined Manhasset (N.Y.) and Westbury (N.Y.) Meetings and finally Hanover (N.H.) Meeting. She met Roy Moger, a member of Westbury Meeting, and they married in 1954 and lived in Roslyn, N.Y. With a degree in library science from Columbia University, Elizabeth worked as a reference, children’s, and bookmobile librarian for many years. She started in Baltimore at Enoch Pratt Library (from which she was fired for her principled refusal to sign a McCarthy‐era loyalty oath). After working in the Great Neck, Elmont, and Mount Vernon, N.Y., libraries, she retired and became an archivist, specializing in Quaker history. Among her many roles in monthly, quarterly, and yearly meetings, she was keeper of the records of New York Yearly Meeting, supervising the transfer of 300 years’ worth of delicate Quaker documents from the Haviland Records Room in New York City to Friends Historical Library at Swarthmore College. She also served on the boards of Oakwood Friends School and Westbury Friends School and with Roy attended Canadian Yearly Meeting for many years. A passionate historian with a particular interest in Quakers in the United States, Elizabeth edited Quaker Crosscurrents: Three Hundred Years of Friends in the New York Yearly Meetings by Hugh Barbour (Syracuse, 1995). She also published many articles on Quaker history and record‐keeping. After moving to Hanover in 1999, she volunteered at Rokeby Museum. Her article “Quakers as Abolitionists: The Robinsons of Rokeby and Charles Marriott” appeared in the journal Quaker History in 2003. Elizabeth was predeceased by her husband, Roy Moger, in 1990 and her son, William H. Moger, in 2001. She is survived by two daughters, Susan Moger (Ted Armour) and Patricia Moger (Sid Reischer); a daughter‐in‐law, Ruth Ann Moger; three grandchildren, Benjamin Moger Williams (Michala), Rachel Elizabeth Moger‐Reischer, and Roy Moger‐Reischer; a great‐grandson, Liam Williams; two brothers, Ted Haas and Stephen Haas (Jan); and many nieces, nephews, and grand‐ and great‐nieces and nephews. Memorial contributions in Elizabeth’s name may be sent to Rokeby Museum, 4334 Rte. 7, Ferrisburgh, VT 05456; to the Pickett Fund for staff educational opportunities at Kendal at Hanover, 80 Lyme Rd., Hanover, NH 03755; or to any organization dedicated to uplifting the unfortunate. Plank—Eleanor Bent Plank, 86, on May 26, 2013, in Mitchellville, Md., after a brief illness, with her children by her side. Eleanor was born on December 11, 1926, in Berea, Ky., where her father, George Roberts Bent, managed the Berea College store. During childhood summers she spent time on the family farm of her mother, Eleanor Hopkins Bent, in Granville, Ill. After receiving a degree in elementary education from Oberlin College in 1948, she earned a master’s from Columbia University Teachers College and taught elementary school in the Chicago area. At her father’s suggestion, she volunteered for an American Friends Service Committee (AFSC) project outside Mexico City in 1951. There she met John Plank, who, smitten, followed her back to Chicago. They married in 1952 under the care of Evanston (Ill.) Meeting. After a year in Haverford, Pa., where she again taught elementary school, they led an AFSC project in El Salvador in 1953–54. In 1954 they settled with their new baby in Cambridge, Mass., for John’s work on a PhD in Latin American politics. Her memories of this period ranged from grim recollections of boiling diapers in a small apartment to delighted recall of walking the baby around Cambridge and making friends with other young couples, many in Cambridge Meeting, which they joined. In 1956–57, she served as president of the Harvard Dames. In 1957, just after a second child was born, John left for Peru for a graduate research fellowship, and Eleanor flew alone from Chicago to Lima with a three‐year‐old and a three‐month‐old. The family lived in Lima and later in Buenos Aires, Argentina, where Eleanor rode herself and both children to the park every day on a bicycle. They returned to Cambridge, and a third child was born in 1960. In 1963, the family moved to Washington, D.C., for John’s work with the Kennedy Administration. Eleanor volunteered in the D.C. public schools, participated in early Head Start efforts, tutored, and helped to create a library at Morgan Elementary School. The family became early members of Bethesda (Md.) Meeting. Eleanor participated in civil rights and anti‐war demonstrations with that community throughout the 1960s. She early and avidly supported the anti‐war Democratic nomination campaign of Eugene McCarthy. In 1970 the family moved to Storrs in Mansfield, Conn., for John’s work at University of Connecticut. In later years, Eleanor would confess how difficult it had been for her to give up her life in Washington, D.C., but no one would have known it from the way she threw herself into her new community’s schools, library, and Storrs Meeting, where she helped to plan a new meetinghouse. She served on the Mansfield School Board, and was president for six crucial years during which management of the high school transferred from University of Connecticut to Mansfield, and she helped establish the Mansfield Dance Council. She also served on the Democratic Town Committee and as a Democratic poll worker, never missing an election. The first of seven grandchildren arrived in 1983, and she became a devoted grandmother, always eager to assist with newborns and delighted to join in any extended family gathering. In the weeks following the World Trade Center attacks in 2001, she joined a small group of pacifists in Mansfield to protest the U.S. invasion of Afghanistan. Knowing she was part of a tiny minority, she insisted that voices be raised in the cause of peace even when there was little immediate hope of changing public opinion or redirecting policy. John died in 2005. At her children’s behest in 2011, she moved to Collington in Maryland, once again. Although reluctant to leave behind the life she had built and come to love, she made her transition without looking back and brought energy and enthusiasm to her new community. In her last years she took two trips to England and two to California to visit her sons, and spent time with her daughter’s family every week. Eleanor is survived by two brothers, Wilson Hopkins “Tony” Bent (Ruth) and George Roberts “Bob” Bent (Ruth); her brother‐in‐law, Stephen Jason Plank; two sons, David Nathan Plank (Susan Drabik) and Geoffrey Gilbert Plank (Ina Zweiniger‐Bargielowska); a daughter, Margaret Hopkins Plank (David Souders); seven grandchildren, Michael Plank, James Plank, Emma Marcus, Peter Souders, Sonja Bargielowska, Kristina Souders, and Timothy Souders; and many beloved cousins, nieces, nephews, and friends. 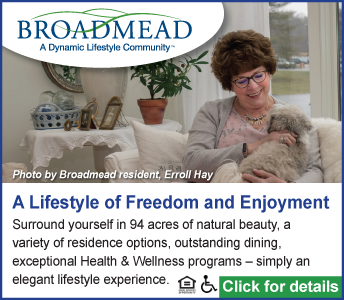 Rhoads—Mary Elizabeth Gaunt Rhoads, 102, on May 11, 2013, at Crosslands in Kennett Square, Pa., peacefully, in the presence of her children, her daughter‐in‐law, and two of her grandchildren. Mary was born on August 31, 1910, in Collingswood, N.J., and grew up in South Jersey. She attended George School and earned a bachelor’s from Earlham College. Raising her family in Moorestown, N.J., and the Brandywine Valley of Pennsylvania, she was a volunteer in her communities and most recently a member of Kennett Meeting in Kennett Square. Her passions included collecting decorative fans, nature, education, peace, clowning, and laughter. She was a founding member of the Fan Association of North America, a guide at Ashland Nature Center and at Brandywine Creek State Park, a teacher at Sanford School, and a volunteer at the Tick Tock shop. Many saw her as a role model because of her wisdom, generosity, humility, spirituality, and gentle sense of humor. For her last 26 years, she lived at Crosslands in Kennett Square. Her husband of 68 years, Richard Rhoads, passed away in 2005. She is survived by one sister, Caroline Headley; one son, David Rhoads; two daughters, Ruth Engler and Winnie Givot; five grandchildren; and six great‐grandchildren. In lieu of flowers and in the spirit of her generosity, her family welcomes contributions to Pacem In Terris, 1304 N. Rodney St, Wilmington, DE 19806 or to the Mary Gaunt Rhoads Scholarship Fund, Earlham School of Religion, Earlham College, 801 National Road West, Richmond, IN 47374. Tehranian—Majid Tehranian, 75, on December 23, 2012, in Newport Beach, Calif. Majid was born on March 22, 1937, in Mashhad, Iran, and came to the United States at 17 to serve as a delegate to the 1955 New York (International) Herald Tribune Forum, where he met President Eisenhower. He earned a bachelor’s in government from Dartmouth College and a master’s in Middle Eastern Studies from Harvard University. He also earned a PhD in political economy from Harvard, where he lived in the Friends meetinghouse for two years and participated in an AFSC Peace Caravan. He attended Friends meeting while at Oxford in the late 1970s and attended and later joined Honolulu (Hawaii) Meeting when he moved there to teach at the University of Hawaii. When he applied for United States citizenship, he showed his commitment to pacifism. Although he affirmed his allegiance to the country, he said that he would not be willing to bear arms on behalf of the United States, citing his long history as a pacifist. The local director of immigration refused to grant him citizenship, but with support from the Congressional delegation of Hawaii and from Honolulu Meeting, Majid explained the difference between allegiance and willingness to bear arms, and immigration granted his citizenship. He dedicated his life to fostering international understanding and peace, working around the world. He traveled to or lived in six continents and approximately 100 countries. He served as director of Social Planning at the Plan Organization of Iran, funding director of the Iran Communication and Development Institute (Tehran), senior fellow at Saint Anthony’s College at Oxford University, program specialist at UNESCO (Paris), trustee of the International Institute of Communications (London), professor of international communication at the University of Hawaii, director of the Spark M. Matsunaga Institute for Peace at the University of Hawaii, senior fellow at Harvard University’s Center for the Study of World Religions (Cambridge), and director of the Toda Institute for Global Peace and Policy Research (Honolulu). Besides teaching full time at University of Hawaii, Majid taught at Lesley University, New College, University of Tehran, Harvard University, Massachusetts Institute of Technology, Oxford University, and Soka University of America. An internationally recognized scholar, he was a Fellow of the World Academy of Arts and Sciences and a member of the Club of Rome. His publications, including over 25 books and 100 articles, were translated into French, Spanish, Italian, German, Norwegian, Finnish, Polish, Slovenian, Korean, Japanese, Bahasa Malay, Arabic, and Persian. He enjoyed swimming and poetry as daily pastimes. Majid is survived by his wife, Katharine Kia‐Tehranian, with whom he enjoyed 40 years of marriage; four children, Maryam Kia‐Keating, John Tehranian, Yalda Uhls, and Terrence Tehranian; and six grandchildren. Memorial donations in Majid’s name may be made to Amnesty International.